Cultural fit is best understood when you consider it within the context of your organization's culture and how your organization's culture was formed. A potential employee may express and exhibit the characteristics, language, and values that exist within the current organizational culture - or not. You want to hire only candidates whose belief and behavior systems appear congruent with your organizational culture. The candidate whose values, beliefs, outlook, and behavior are congruent with those existing within the current organization is likely to be a good cultural fit for the organization. An employee who is a good cultural fit works well in the existing workplace environment. Employees who fail to fit within the environment generally leave to find a work environment or culture which is more congruent with their own values and beliefs. One of the main purposes of a job interview is to enable the employees on the interview team to assess the potential cultural fit of a job candidate. Interaction in the interview setting with a potential employee is key to employee selection. The candidate must exhibit both the necessary qualifications to perform the job and the essential fit needed to work effectively within the existing organization. The purpose of the majority of interview questions asked during a job interview is to assess a candidate's cultural fit. How the candidate answers the questions is a deciding factor in employee selection. In a behavioral interview (which is recommended), how a candidate has approached a variety of work situations in the past tells you whether the candidate's style and behavior are congruent with the style used successfully in your organization. When you are considering the cultural fit of an applicant, here are examples that will guide your assessment. An employee who works well on a team and who appreciates the input of a variety of people is likely to work well in an organization that stresses teamwork and in which teams are integral to daily operation. An employee who wants to work alone the majority of the time may not find a good cultural fit in a team-oriented workplace. An employee who wants to be told what to do will not fare well in an organization that stresses employee empowerment and personal accountability. An organization leader whose style emphasizes command and control will not successfully lead in an organization in which employees expect to have their input, opinions, and commitments solicited and carefully regarded. An individual who needs flexible hours because she has children with diverse activities before and after school is not a good cultural fit for a job requiring rigid work shift coverage. A developer who is most comfortable working alone in a cubicle or an office might not have the cultural fit necessary to work on a development team that shares code. This will be especially tricky if each person's part of the project must work interdependently with the work of other employees. So, cultural fit is the ability of an employee to comfortably work in an environment that is congruent with his own beliefs, values, and needs. The challenge for employers is to identify and hire employees who fit their work culture. The second challenge for employers is to consciously shape a work culture that will ensure the success of the organization. The employees hired must be trusted to help with this fine balance. 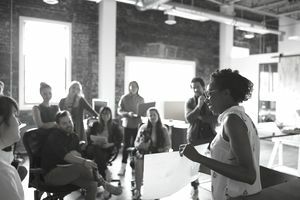 Culture, the environment you have created for employees in your workplace, is made up of the values, beliefs, underlying assumptions, attitudes, and behaviors shared by a group of people. Culture is the behavior that results when a group arrives at a set of - generally unspoken and unwritten - rules for working together. An employee who is a good cultural fit will work well within the environment and culture you have created.